For an individual man, the daunting task of making sense of the time between birth and death is virtually impossible. We dedicate ourselves to our work, to our faith and families, and yet we still find ourselves wondering: what is our purpose? I believe this is due to the pragmatic nature of humans. Like a hammer is used to build a house or a light bulb to illuminate, we want to find in ourselves a purpose. A functional, objective purpose. Ecclesiastes, for it’s intense doubt of the worth of human effort is not a book that belongs in the Bible that we tend to associate with Christian thought. Most likely, you are reading this in a country heavily influenced by the propagation of Judeo-Christian tradition. Because of that immersion, it’s very difficult to separate your answers about human purpose from even the slightest inklings of divine power. That is, even if you don’t believe in God, you understand that religion is on our minds when we consider our larger purpose. When discussing, Three Colors: Blue I considered the Aristotelian notion that life’s purpose is, “happiness.” And that ambiguity plays heavily in Julie’s decisions in the film. But what happens when the scope is greater—when the disillusionment runs deeper, to the core of not just who you are, but what it is to be alive? Thus we enter Truman Burbank’s (Jim Carrey) world. The tragedy of the film, and perhaps also the television show is that Truman pursues life with the same fervor as we do, yet he is merely surrounded by actors. His friendships, while brilliantly choreographed over decades, are not real or genuine. His interactions are posed perfectly to sell products-- A wife (Laura Linney) that always seems to be focused on the material. In a way, Truman’s world is just an exaggerated version of our own. The existential questions that haunt Truman burden us at the same rate in similar ways. 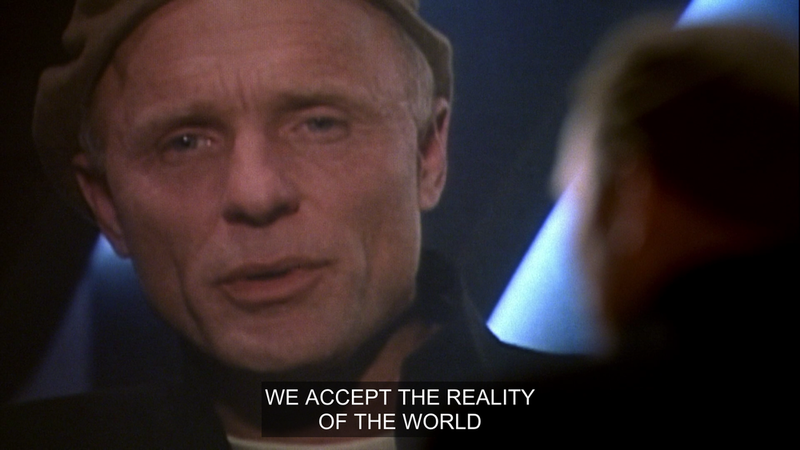 And I think this frames the way that we must force ourselves to watch The Truman Show. Truman is alive, made of flesh and bone, but unknowingly, he’s simply a piece of fiction. A man carved and molded through manipulation to be the Truman we see on-screen. And in that same way, we are the product of our pasts and we struggle with fake, disingenuous relationships and a materialistic society. His reality seems so distant at first glance, but upon inspection it closely mirrors ours. 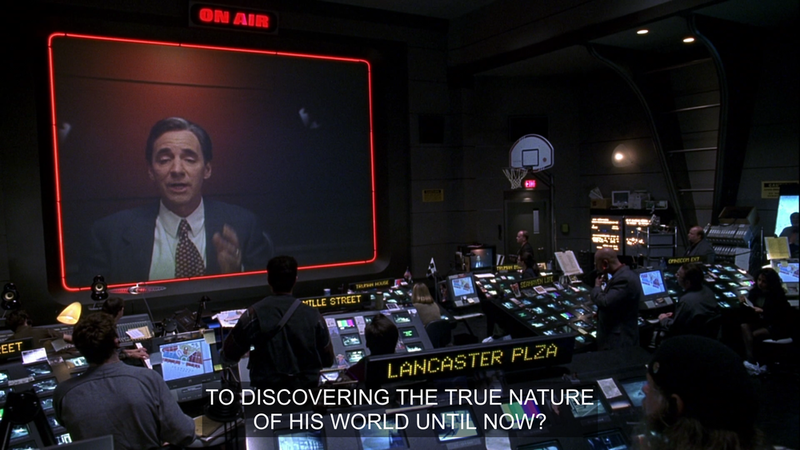 A sentiment reinforced early on in the film. 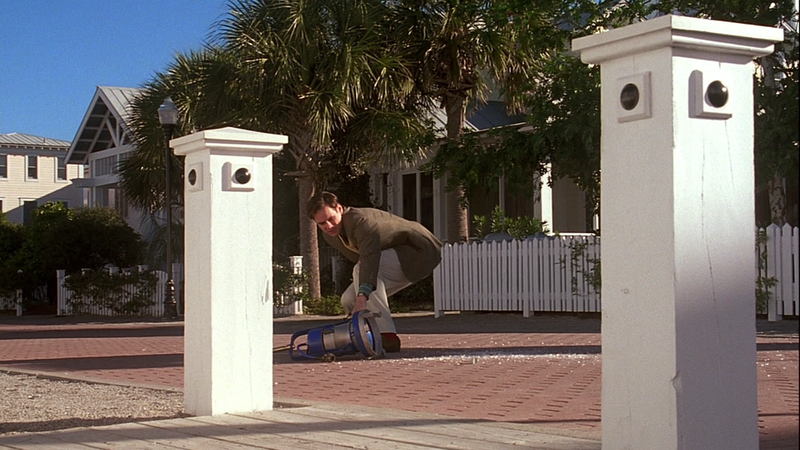 The Truman Show poses immensely difficult questions about the nature of existence, but at the beginning, Truman starts his day in a simple, genial way. Each morning, delivering the same phrase. “In case I don’t see ya, Good Afternoon, Good Evening and Goodnight.” The neighbor’s dog jumps on him—it’s the same every single day. And at this point, when Truman’s world is perfectly functioning, when every day is exactly the same, when the cycle of meaningless interaction goes unnoticed by Truman, this is when the film begins. As Truman is getting into his car, a studio light falls out of the sky and crashes onto his street. In some action that hearkens back to the primordial apes in 2001: A Space Odyssey, Truman picks up the light, then turns and looks to the sky. Empty. Later, Truman sits on the beach, remembering his Father’s, “death.” A column of rain falls on him, and only him. He gets up and the rain follows. The universe is hinting to him, that something isn’t right. He’s becoming slowly aware that the world he’s living in isn’t genuine. It’s an imitation—a reproduction of life. And indeed, in a escalating set of circumstances, we see Truman recognize and become aware to the façade’s built up around him. Yet the people of Seahaven work to maintain the cycle-- every day the same things, but promoting new products. In perhaps Weir’s most brilliant use of the camera in the film, Truman enters a revolving door. He slowly makes one revolution, looking confused at the world around him, but instead of exiting, he goes around once more. Once again, he doesn’t exit, and then instead of entering his workplace, and continuing the choreography he’d become accustomed to for the past thirty years, he exits. And suddenly, Truman sees the world with new eyes. His smile is gone. He looks as if this is the first time he’s stepped foot in the town square that he’s frequented since he was a child. He looks at everyone walking the streets as if they’re enemy spies. In the Myth of Sisyphus, Albert Camus describes what he calls, “the absurd.” The absurd is a concept that carries through virtually all of his work. And while the absurd lingers, and grows within all of us (Camus likens it to a worm), the crisis that Truman faces, and the character Sisyphus (as told in Greek Mythology) is one of an acute realization. Not one that just slowly builds and bubbles over, one that lingers and grows, and then detonates and we’re no longer able to look back. And the question lingers in a person, like that of the worm of absurdity before the moment of clarity. What do you do when you become aware of the circular and futile nature of your life and effort? How do you continue living, if life has no meaning? Truman sits on the beach with Marlon immediately following his realization that there’s something gravely wrong with his world. After Truman violently tries to escape Seahaven, he’s brought back home by the Police. But Truman remains unsatisfied. She then tries to stifle his anger by offering him cocoa, which is really just a product pitch for a drink called Mococoa. Meryl’s bubbly tone contrasting with Truman’s misery. The task of walking Truman off the ledge falls to Marlon. And here we switch to a control room high in the sky, hundreds or thousands of feet above Truman, Christof speaks into a mic. Ironically, the Greeks were perhaps one of the more existentially inclined civilizations on earth. Ironic because there wasn’t a single existentialist among them, yet they lived their life with their eyes directly focused on this world, and the years they inhabited it. The Gods that they created and worshiped were immortal, unlike themselves, and reflected either a disdain or compete disconnect from the struggles of the mortal. For good reason, how could an immortal being understand the existential questions that plague a mortal mind? While the Greeks didn’t necessarily believe that the Olympian Gods created human life, they understood that their presence gave them purpose. And they lived their lives knowing full well that virtually nothing came after death. And I ask myself quite often, how do we reconcile that in our modern world? A world where our lives are so often spent focusing on what comes after. While the verse at the head of this piece reflects the same futility Camus describes, Ecclesiastes is joined to a text that provides inherent purpose. That purpose is religion. 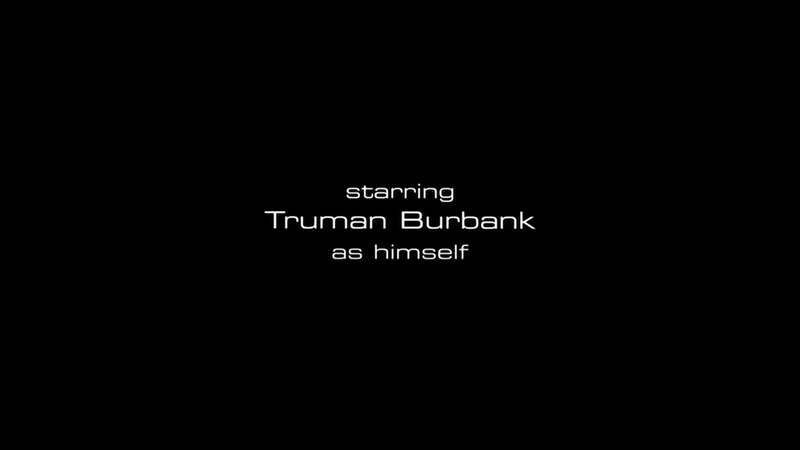 But that’s not the world that Truman Burbank lives in. Truman’s world is manipulated at the whim of a single man; Christof. Through clever misdirection, Truman escapes the gaze of the cameras long enough to hijack a boat and sail to the edge of his universe, and there he slams directly into the wall. The bow of the boat adorned with an eagle (probably signifying freedom) pierces the facade. And all of this comes to a head, Truman realizes the extent to which his life is a lie. That there is no way to escape the lies and the pain of the world. And Truman is posed with a question, and a choice between two things. Albert Camus was an atheist, and in that sarcastic quote from his essay, we see the contempt he projects onto whatever Gods might have existed. In this case, Camus is sarcastically jabbing at the very idea of the God’s punishment. A sentiment echoed in the film when Sylvia, Truman's long lost love, yells at Christof, "What right do you have to take a baby and turn his life into some kind of mockery?!" He responds, "I have given Truman a chance to lead a normal life. The world, the place you live in, is the sick place." This paradox of Gods love, and the gift of life lingers like the taste of copper on the back of philosopher's tongues. Epicurus frames the issue succinctly, "If God is willing to prevent evil, but is not able to then He is not omnipotent. If He is able, but not willing then He is malevolent. If He is both able and willing then whence cometh evil. If He is neither able nor willing then why call Him God? " For Sylvia, this anger is raw, and directed right at Christof. Ironically, in our world, we see Truman's life as lesser because its all a part of Christof's creation-- a fraud or cruel game. But could we not ask the same questions of our own reality? The Greek’s creation of the specific punishment Sisyphus endures shows the way they viewed the nature of human existence. It’s a slog characterized by meaningless effort. And yet, the Greeks were not a civilization that would describe as fruitless, by any stretch of the imagination. They were responsible for some of the greatest leaps in technology, philosophy, politics, and art the world has ever seen. So why, when staring down this void would they become one of the greatest civilizations in the history of the world? Each time Sisyphus rolls the rock up the mountain, and each time he reaches the top, and each time the rock immediately rolls back down all the way to the plain where he started. But Sisyphus doesn’t abandon his task. He turns and walks back down the hill to the rock, yet again. Truman's father's death at sea haunts him for the entire film. The ocean frightens him so much that he wouldn't go on a ferry to perhaps save his job. Yet, Truman's quest for freedom, truth, and reality puts him at odds with Christof, who uses a gargantuan storm to capsize his boat, forcing Truman underwater, and nearly drowning him. The ship rights and Truman lays sprawled out, over the edge of the boat. He coughs up seawater, gagging, but he gathers himself and raises the sail. And in that moment, when the storm that killed him has past, when he shook his fist at God and called his bluff, we don't see the Truman that stand a ferry ride. We see a Truman that confidently steers his own ship, in spite of everything thrown at him. Camus writes, "There is no fate that cannot be surmounted by scorn." Bret Hoy is the creator and co-editor of Monolith Medium, an award-winning filmmaker, and writer.